North Carolina State University researchers have managed to take full remote control of a cockroach's movements via off-the-shelf technology to, essentially, manipulate what the creature is thinking. 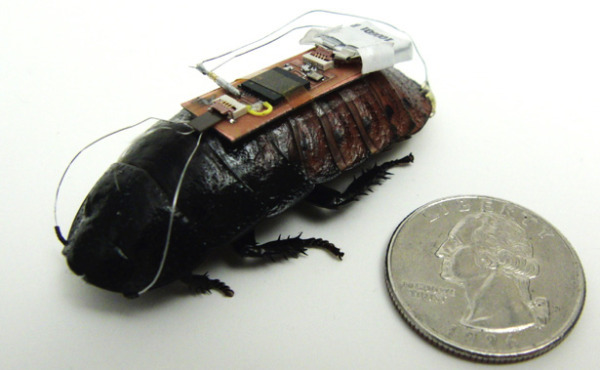 A commercially available chip with a wireless receiver and transmitter is used to send commands to the cockroach, via its antennae and abdomen. The technique fools the creature into thinking either an obstacle is in front of them (causing a change in direction) or that danger is nearby (causing the start/stop of movement). This allows the scientists to control the creature precisely along the curved path laid out for this experiment. This new form of biobotic cockroach could have a life-saving future, potentially searching for trapped disaster victims if a sensor is placed onto the insect. There's the other, more scary prospect of just what kind of scale this technological control of a biological control could be taken in the future (human-cyborg hybrid? ); but so far, pretty damn fascinating.